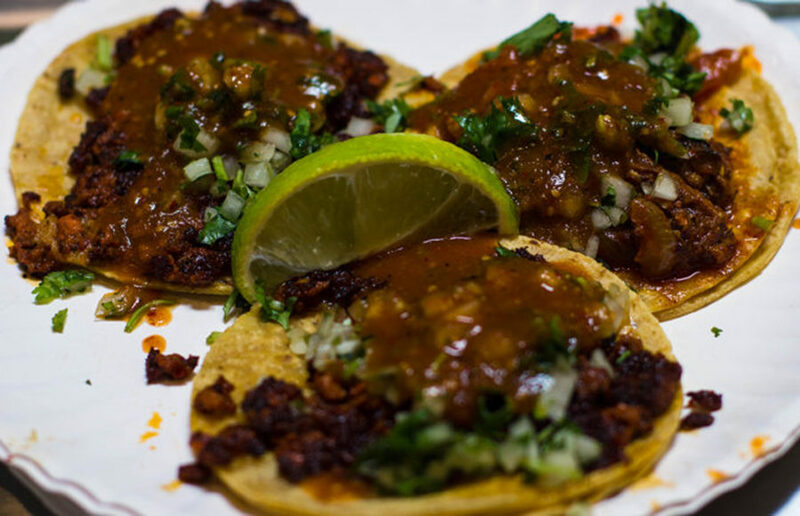 National Taco Day may be marked Oct. 4 (also: Wednesday and not a taco Tuesday? ), but there’s no reason we can’t taco ‘bout it every day. With three easy recipes, here’s how get your taco fill for breakfast, lunch and dinner. Every meal. Every day. Every week. Get loco. Place waffles on microwave-safe plate and defrost according to the directions on the box. Fold thawed waffles in half, secure with toothpicks, and place on baking sheet. Bake 5 minutes or until waffles are crisp. Set aside. Meanwhile, cook sausage in large skillet over medium-high heat for five minutes or until cooked through. Remove sausage from skillet and add eggs to same skillet. Scramble to your heart’s content. Remove wooden picks from waffles and fill your tacos like there’s no tomorrow. Drizzle with syrup, if desired (and it will be desired). Unroll the pie crusts and cut them into six 3″ x 4” rectangles, covering with a towel to keep from drying out. Heat a frying pan with oil and cook the meat until completely heated through. Add the taco seasoning and stir. Add the corn and beans and cook for 2-3 minutes. Remove from heat and let cool. Place six of the twelve rectangles on baking sheets. Top with a spoonful of the meat mixture and a handful of shredded cheese. Cover with the remaining crusts and use a fork to crimp and seal the edges. Using a fork, poke holes on the top to allow steam to escape. Brush gently with the beaten egg and water mixture. Bake for 15 minutes until golden brown and show Kellogg’s who’s boss. Trim the fat off the chicken breasts and set aside. Meanwhile, mix salsa with the taco seasoning until well blended. Cover and cook on high for 4 hours (or on low for 6-8 hours) until cooked through. Shred the cooked chicken with a fork and fill your tacos. Go crazy and top ‘em off with whatever you like, but we’ll recommend avocado, lettuce, sour cream, and a little bit of cheese. And when people begin to question you, don’t let them get jalapeño business because we at the Clog don’t carrot all. Happy National Taco Day feasting!